OK, I totally get why people should not live in poverty and desperation. But why does that translate into cheers for industrially processed foods? Don’t we actually consume more sugar and salt than we need to? How about something in between? Well made, fairly and sustainably produced. And consumed with reason. Laudan makes a good case for industrial sugar and salt, although at the end she casually adds “rice, flour, wine, chocolate and many other foods we cherish”. Here, I think, is where we part company, because, unlike the critic quoted above, I want to distinguish foods from ingredients. On flour, for example, too right I don’t want to be grinding my own grain, as Rachel herself has made clear in much of her writing. But I also don’t want to be using only extremely industrial flour, and luckily I can afford to buy flour that is “well made, fairly and sustainably produced”. (“Consumed with[in] reason,” not so much.) At least I have the option. With very few exceptions, I cannot feel the same way about artisanal salt and sugar, although I confess that if I could get it easily, I would buy Maldon Sea Salt, and if I did, I would almost certainly eat more salt than I do at present. I also feel, although I didn’t want to abuse my position as host and labour the point, that the very cheapness of sugar and salt does contribute to overconsumption. I’m pretty sure that the reason sugars, in all their forms, are cheap has more to do with subsidies and unpaid externalities than anything else, but whether getting rid of those would make a difference to consumption now, I have no idea. I doubt that it would make much difference to how much of either salt or sugar would be available for preserving. 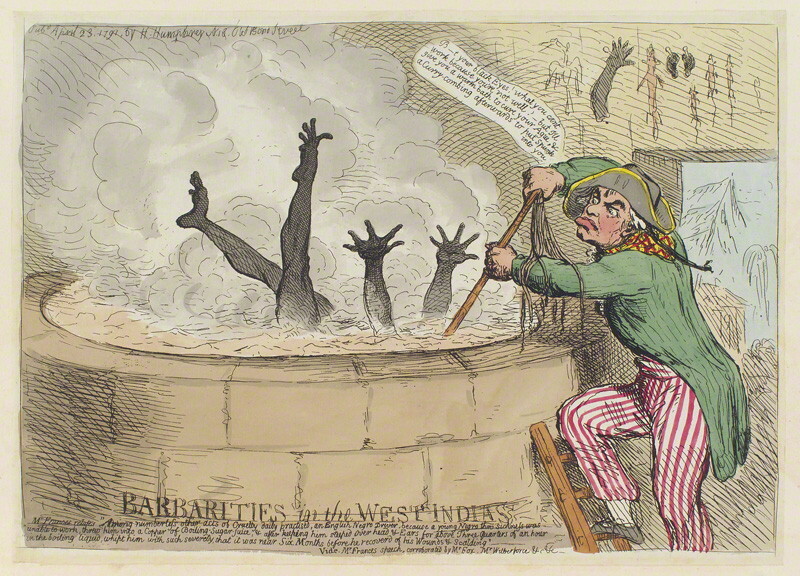 Cuisine and Empire: Cooking in World History, Rachel Laudan’s eagerly anticipated new book, will be published in September. Sugar has been the focus for many wonderful books, articles and the rest of it. Reading around for this episode I came across Mike Rendell’s website, which has some interesting historical insights. And ‘The Dunghill of the Universe’ The Sugar Barons: Family, Corruption, Empire and War looks worth a read too. The Food Programme, on BBC Radio 4, took a new look at Sugar: Pure, White and Deadly? — their question-mark, not mine — at the end of May. And pretty good it was too. 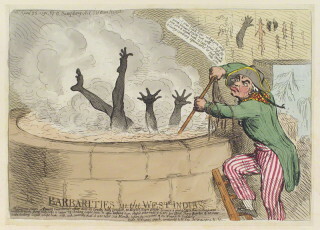 Barbarities in the West Indies by James Gillray, published by Hannah Humphrey, hand-coloured etching, published 23 April 1791, copyright National Portrait Gallery and used with permission. Podcast cover image of Venezuelan cut sugarcane by Rufino Uribe. Not all progress is bad. Rachel Laudan makes a powerful case that modern methods of making sugar and salt are far superior.